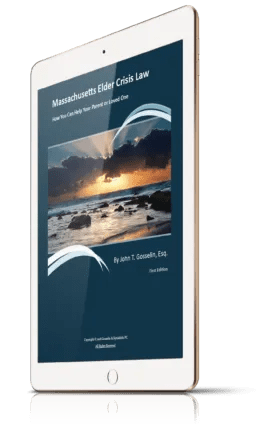 If you are an adult with parents experiencing an elder law crisis in Massachusetts, this guidebook of frequently asked questions will help you navigate the difficult decisions and uncertain path ahead. For instance, perhaps your father fell and hurt himself while tinkering in the garage. As you talked with him further and discussed the incident with his primary care physician, you came to the alarming realization that he is in the early stages of dementia. The revelation touched off a complex suite of emotions, including anxiety about the diagnosis and confusion about how to handle things, logistically and financially. This reference book will give you resources to help your dad with tax matters and health decisions and help you get clearer about your own role in his care. Alternatively, maybe you’re a mother in your 40s who’s caring for young children while also attending to your parents. Being part of the “Sandwich Generation” is never easy, even in the best of times. But perhaps you just discovered that your sick mom’s finances and retirement plans are in complete disarray. Among other things, she needs to move assets to create an income stream through annuities that the state can’t touch. You want to assist her and care for your own kids and (somehow) find time and space to meet your own needs. This book will give you tools and strategies along those lines. In nearly a quarter century of elder law practice I have listened to my clients and learned what concerns them most. This easy to read and informative book is based on the questions that the children of elders and elders themselves have asked me throughout the years. By reading this book I’m hoping that you will gain the core knowledge to address the big picture issues surrounding adding and long term health care in Massachusetts and that you will make yourself better prepared to engage professionals and to serve your loved one when they need you most. The book is no substitute for your own elder law attorney and you should consider getting legal representation as early as possible to allow for the most options. Look for my upcoming titles on transitioning from home to long term care (including a comprehensive Place egg directory) and a primer on trusts in Massachusetts.